I got a new Passport photo taken recently, and thought I'd show it to you all, although I might regret it =) Now I'm not claiming that I'm a 'pro' at good passport photos. I'll never be, and I've made peace with that. But I have learnt from past mistakes, and this time it turned out a lot better than all of my previous photos. Hair too limp & flat (I went to the studio with just-washed-partly-wet hair), so face looks too big, nose & cheekbones too sharp. Expression looks too mean & nostrils flaring too much. Eyes too dark. You shouldn't have overdone the black kohl. Big silver hoop earrings? Really?! White shirt with white background? Sigh. You look too MADE-UP! It's a struggling studio that you'll find out had shut down in 2012, not a cocktail party! Now let's talk about my new photo. 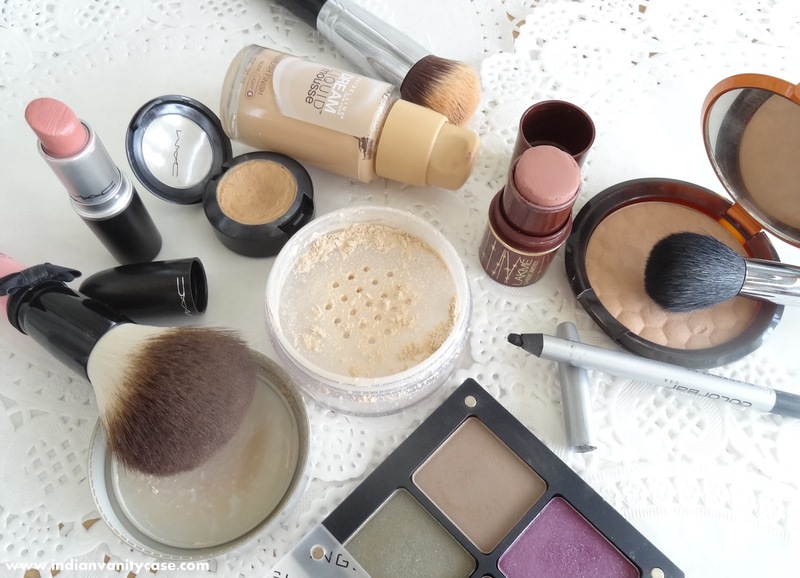 First things first, the make-up! It's supposed to look subtle, and we tried our best. Maybelline Dream Liquid Mousse Airbrush Foundation all over my face & a little extra under my eyes. This foundation is dope. I repeat, it's dope! MAC Studio Finish Concealer to conceal spots. Inglot matte eyeshadow #342 (Swatch here), a taupe-brown eyeshadow all over lids upto my crease, and blended it like I showed here. I also applied a little on my lower lash line. Brown Eyeshadow to line upper lash line. I used Urban Decay Busted from Naked 2 Palette. But it didn't show much. Colorbar Blackout I-Glide Eye Pencil to tightline (on the inner top lashline). Use a gel liner or something that won't smudge on your lower lash line when you blink. Curl Lashes with an eyelash curler. I used a QVS. one. Black mascara on top & bottom lashes. I used a Shiseido Mascara. Skip the bottom if you already have dark lashes. It's not necessary, but if you are pale, it will prevent your face from looking flat under the studio lights. Pick a Matte one. I used The Body Shop Honey Bronze Bronzing Powder #02 under cheekbones, chin & forehead near my hairline. Make sure to exfoliate & moisturize them if they are chapped. Pick a mlbb (my lips but better) lippie or a lip balm. I chose my favorite MAC Patisserie, but I just dabbed it lightly & blotted it a bit, so it looks like a lip balm. Nothing too shiny & no lip glosses. I was tempted to leave it loose, but since my top has a collar, hair up looked better. If you're capable of making a classy bun, even better. If left loose, it should be kept away from your face. Photographer urged me to tuck my long bangs behind my ears, but I made sure to cover the pointy tips. Work/Office wear is best- something with sleeves. I'd personally stick to plain, and stay away from prints & stripes for a passport photo. This time, I didn't want to wear black, coz I'd worn it before. It was either a maroon top with a regular cowl neckline, or this blue top. I picked the blue top, because it has a collar. Any color apart from white will do. Something discreet, nothing too flashy. No big hoop earrings! I went with a pair of Forever 21 studs (shown here). I guess you can skip earrings if wear your hair down. I read somewhere: "Don't wear hats & sunglasses." Makes you wonder if some people really think that's acceptable. As women, it's in our nature to scrutinize & find fault with everything. What's wrong with this photo? My left brow is lighter than the right one. I thought I filled them in evenly. I should have adjusted my ponytail, so it didn't splay so much that it looks like I have the hairstyle that's between a boy cut & a bob. 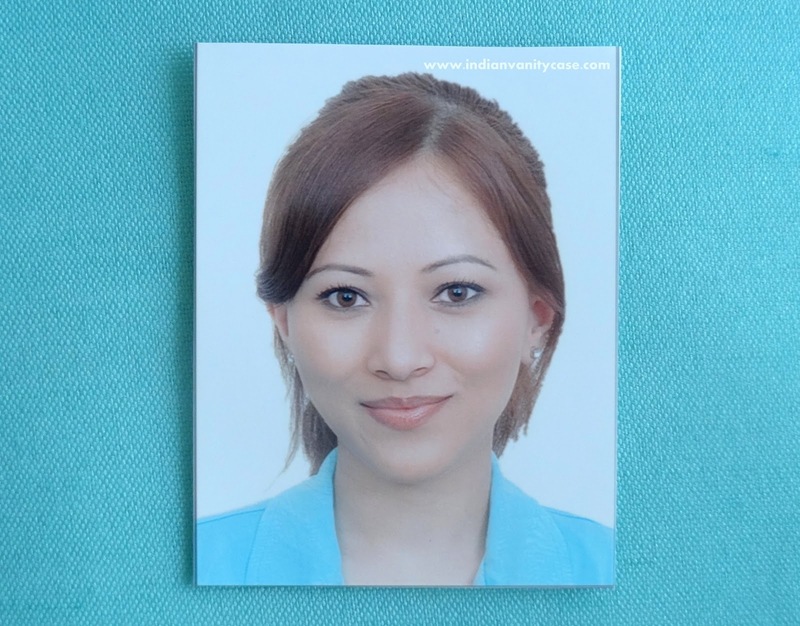 Hope you picked up some useful tips for your next passport photo session. Ohh..I'm sure you'd look great with a little bit of effort :). Thanks! It has come up super cute.. Yes, I was told that too! But then one of mine where my ears were fully covered wasn't rejected last time. Not bad! Better than most CZ! LOL! The No smiling reminds me of Russell Peters' bit.. "You know how they should look for terrorists? Make everyone smile! and the ones who don't, QUESTION THEM!" LOL! Hahaha..thanks for the link. I've not seen that before! LOL he's too funny! haha funny and an useful post! The final result is very pretty! You look fantastic in your photo!!! A customs officer literally chuckled and said, "Well that's a funny photo of you..." about my current passport photo. I knew mine was bad but WOW talk about awkward. I've never had such trouble but the cause of my bad passport photo is the same as yours - my photo was photoshopped without permission! I look like I had super pale skin too, and creepy eyes with really bad eye makeup. 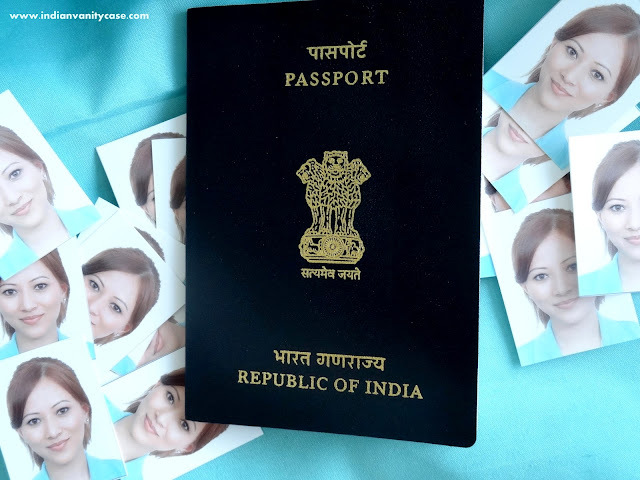 this is a gorgeous passport snap, how could you find such faults :D and, the BBC thingy for the specs people (ROTFL) coz I wear specs!!! even my latest visa snap was the best of all and in fact all my passport snaps are horrible and talk about big hoop earrings, I made the same mistake and it was the worst snap.......I still have the prints!!! Aww..really?! Thanks, although it could look better imo. Powder- I think loose is better n looks more natural. I think TBS has a darker shade in this powder I'm using. or maybe that's only in Bangalore? the Bangalore office is crazy .,.. I so agree !!! @See Bee- Really? It wasn't like that in Delhi. I got the photo ready myself. That's weird. ah haa ... this is so informative :) !!! you look lovely :) !! Hi Cynthia, this is not related to the blogpost, but I was hoping to get some advice from you. I was going through my lipstick collection and found that I tend to buy mostly brownish-red shades. I am trying to be a bit daring and want to try some pinks and oranges for a change - but even there, Eg, even when I bought orange, I ended up buying Maybelline's "bronze orange" which is a brownish-orange. Please help me get out of this brick/rust spell! I look forward to suggestions for people like me who do not like over-the-top colors like fuschia, but would like to start with a few nice pinks and oranges for medium to light skin tones. Thanks so much! thanks so much! Looking forward to your recos. I would also like to add that my complexion is fair, but my lips are on the darker side and I have dark circles too - maybe this is why shades with a brownish tint tend to look good on me? Gosh you've got really beautiful eyes! Hi Cynthia, found this old post and must say that you look gorgeous. I recently had a photo taken for an ID Card and my sis said i could star in "Conjuring 3"!